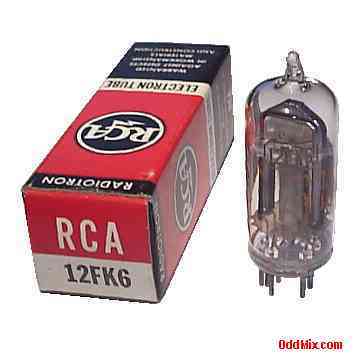 This is a genuine, vintage, discontinued 12FK6 RCA Radiotron Low-Mu Triode Space Charge electronic tube. These miniature, lightweight, portable, compact, tubes were developed to work with the automobile 12 Volt battery as anode supply. Developed for low B+ (anode) voltage automobile radio service as a combined detector, af amplifier use. Useful for antique car radio restoration projects, battery operated instruments or to set up a private vacuum tube museum. It is NOS tube - New Old Stock, unused, boxed, excellent condition. First come first serve, as only one of this rare, historical vacuum tube available!